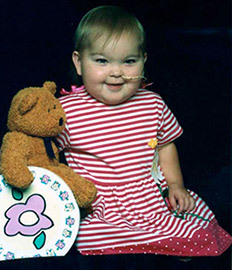 The Aubrey Rose Foundation was founded in memory of our angel, Aubrey Rose. Aubrey was always a very happy baby throughout everything she endured and she smiled continuously. In honor, her foundation provides support and help for those who seek to be lifted from the complexities of life here on earth and to find a greater happiness in those things that could be. Aubrey brought a great light into our lives. Help us pass that light along. Awarding educational scholarships for children so that they can better themselves. In Aubrey’s three short years, she made a positive impact on many people. These scholarships will be based on how children have made an impact on the people around them. Helping families with financial need because of medical expenses of their children. Organizing buying toys and holiday parties to brighten the lives of sick children at our local Children’s Hospital. Organizing dinners for the Ronald McDonald House families to boost these families’ spirits so they can carry on taking care of their sick child. Healing the Worlds Hearts Program – This was developed by Aubrey’s Foundation with help from Cincinnati Children’s Hospital doctors, surgeons and corporate support to provide “simple” heart procedures to sick children in the U.S. and developing countries around the world. We say “simple” heart procedures because these are surgeries which can be performed in the U.S. that can SAVE A CHILD’S LIFE letting them go back home to live a healthy and productive life without follow-up cardiac procedures. Please visit our website, aubreyrose.org, to learn more!